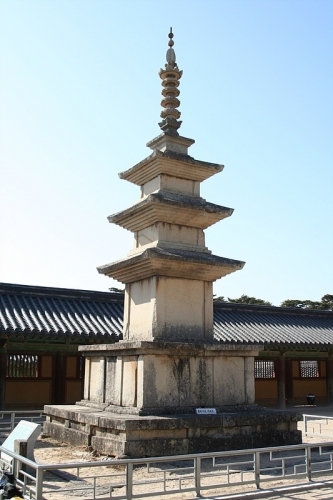 Seok-Ga Pagoda in built in VIII century in the court of the Bulkook (Bulguksa) temple, Kyung-Ju, Korea. The three-story pagoda is admired for its proportions and simple but graceful style. It represents the finest style of Korean Buddhist pagodas that evolved from China’s multistoried pavilion-type wooden pagodas.Together with Tabotap pagoda makes a unique composition: none of the some thousand stone pagodas scattered across Korea excel them for profound philosophical depth and aesthetic charm. A paper scroll of the Pure Light Dharani Sutra, printed between 706 and 751 found in pagoda in 1966, which is recognized as the world’s oldest printed material. Ageing of material, exposure to outdoor conditions and differential settlements make pagoda stones moving. Since there is no mortar between the stones, the movement is relatively free and there is an elevated risk of pagoda distortion or serious damaging. 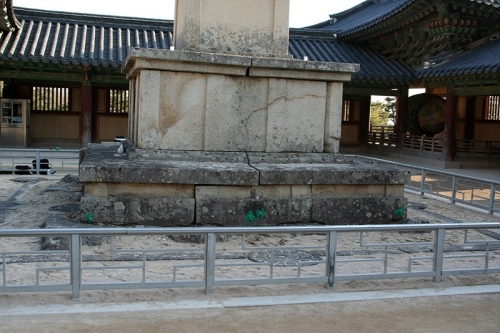 View to Seok-Ga pagoda is given in Figure 1, and the view to openings created between the stones is visible in Figure 2. It was decided to monitor pagoda in order to understand its structural behavior and control dimensional variations and movement of the basis. The results of monitoring are used to model the behavior and plan and optimize maintenance and conservation works. Long gauge sensors were installed along the basis while the inclinometers (tilt-meters) were installed on the second floor stereo bate. 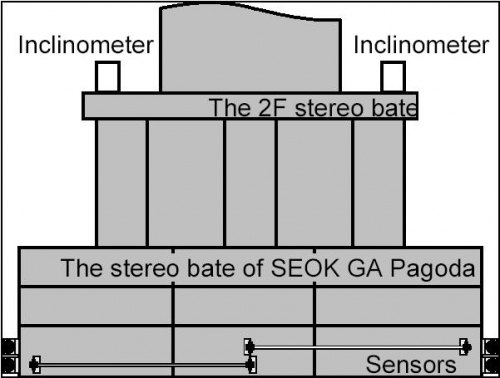 The sensor position is schematically presented in Figure 3 and the view to sensors upon the installation in Figure 4. The sensors were surface mounted and protected with metallic plates. Inclinometers were also protected with for the purpose constructed boxes. Long-term continuous monitoring is performed.